Many computers in the early days used the windows XP operating system which was the most popular operating system in the world. This was widely preferred in all corporate companies and offices. It had all the best features one would wish to have in their PC. Then the later updates of the operating system became popular and people tend to move to the latest operating systems. People always attract to newer versions of anything in the market. So now the problem in moving to a newer version of the operating system is that they might have had all the software and files in the older version. This problem forces many users to stick to older versions. Now a solution has been found out, yes you can transfer the files and software from one OS to another OS. This can be done with the help of software available in the market. Now you can switch to any version of the operating system without any loss of files and software. One of the most popular software for this purpose is windows easy transfer which allows any windows user to transfer files and software from one operating system to another operating system. This software has made life easier for many users who want to update to new operating system. You have to install the software in both the computers and connect them in a single network. If the computers are not visible then add them to the network by clicking on the + icon and enter the correct IP address. After connecting the two computers you can customize which files and software you want to transfer between the PCs. Click on the Edit button and select the files and folders you want to transfer. Then click on the start button to start the transferring process. The time taken to transfer the files and folders depends on the total size of the folders. More the data selected, the more time it will take to transfer data between the computers. Transferring files to new computers allows you to save the data and use them in other operating systems. This software is useful for people who often update their operating systems and never want their files and folders to be flashed. 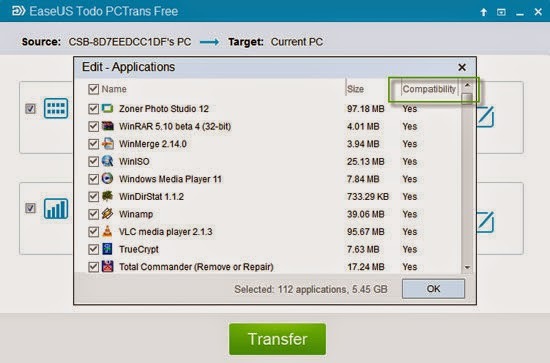 Windows easy transfer helps you to transfer files between one operating system to another system by connecting the computers in a network. This software can also be helpful when you want to sell your old pc and buy a new one. You can connect your old Pc and the new Pc in a network and transfer the files and software to the new PC from the old one. This will help you to save the important files and software which you don’t want to lose because of buying a new PC. Windows easy transfer is one of the best software in the market or transferring files between PCs.